It seems strange to right about this extra curricular activity of mine since as of next week it will be over, but it is something I have been spending time on since September, so it deserves a few words. Our local university radio station is quite fun hodgepodge of shows, some funny, some entertaining, some an experiment. It's the reason campus radio stations exist. They are real public radio. Three years ago a show was born, or more specifically I think evolved from something else. 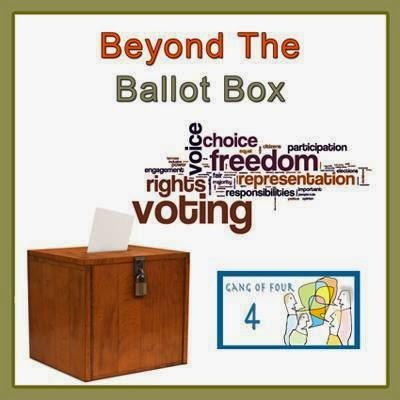 Beyond the Ballot Box brought local, provincial, national and international politics to the listeners every week through a round table discussion. Not only were the people sitting around the table (which by the way is most definitely not round) intelligent and funny, they also represented a variety of political views, which is always refreshing. Because of my work with the Green Party and leader Mike Schreiner I kept in touch with the hosts, Jan and Oliver, since they also conducted interviews. I really enjoyed listening to their interviews since they really took a good cop/bad cop attitude with their guests. Early this year I was asked to guest host on one of their rotating weekly programs, The Guelph Hour. I have lots to say about Guelph, so I fit right in, and it was lots of fun. After that spot I was honored to be asked to join them more regularly. You see one of their regular members, Phil Alt, had decided to run for city council and it's pretty difficult to stay impartial when commenting on something you are a part of. Which is also why I had to decline the offer. At the time the provincial election was right around the corner and since I was acting at the communications director for Mike and the Green Party, acting as the media probably wouldn't work. Luckily for me, having political opinions and leanings works on this show. The point of the round-table is that there are a bunch of different views represented, so once the election was finished, and I was no longer in the position of begging for media (which is what it feels like sometimes when writing and sending press releases) there was less of a conflict with me being part of the show. So for the last four months I was able to join in every few weeks and dissect the news of the week in the world of politics. I found being on the show really challenging. In a good way. It's easy to become complacent to what's going on at the top. It's also easy to become so embroiled in it, and enraged by it that you burn out. The show always helped to lighten things up. The show always took time to see some of the absurdities in politics. Being able to laugh at problems is really good. I'm really sorry to know that it won't be continuing after next week's show. The hosts, Jan and Oliver, each have many responsibilities that make it difficult to keep doing a weekly show, for no money, let me remind you. I know I take about 3 hours to prep for the show some weeks I'm on, and I just have to show up and talk. I respect the amount of work everyone else puts in to consistently create smart, insightful commentary on the news. In a community the size of Guelph, the end of a balanced and fair news source is a sorry thing to see. I hope something fills the void in the new year. **spoiler alert, something will be replacing it, but I don't know the details yet. Follow me on the Social Medias! Need a Book? Go Shopping! Accountability, what is it good for? It's not stalking, it's research! Collaboration and Competition look a lot alike!